With that said, let’s get on with the articles! Xiao Lin does some stupid crazy damage with Water Dragon Attack when you set her up. Her third skill attacks random enemies four times, and the damage increases by 25% per harmful effect on the enemy she hits. If she’s attacked while her third’s on cooldown, she has a chance to counterattack. This KFG is, like, the best damage dealer that you can get in the Raids in general. Seriously! She’s great in the Rift of Worlds and pretty much every elemental beast except wind. 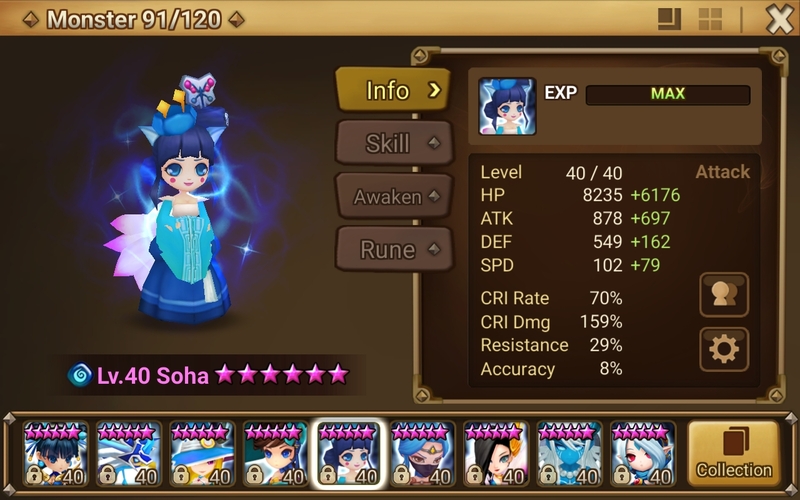 I would definitely recommend her for the raids and in NB10. Another raids monster here; Mihyang was actually from the Hall of Heroes last year. She was easily considered one of the best HoH monsters yet, and it’s not hard to see why. All the Sky Dancers are good in their own way. Mihyang’s third skill, Dance of Mirage, will heal everyone based off her attack power, elongate the duration of beneficial effects and then reduce the duration of harmful effects as well! She’s great for raids if you need a backup cleaner, but she doesn’t fully removes harmful effects. Surprisingly high score, I know. I don’t use Soha as a stripper, though; only as an AoE water damage dealer for Fire Beasts and occasionally some Siege Battles. Soha is amazing in Fire Beasts, though. She’s got AoE damage and a massive nuke that also doubles as a self-heal + shield. She’s also the first monster I put Fight runes on. My team needed that last bit of damage to consistently clear the Fire Beast, and with Soha, we have just that! She’s got a really good leader skill, too (as do all the other Nine-Tailed Foxes) so there’s tons of reasons why one should build Soha. 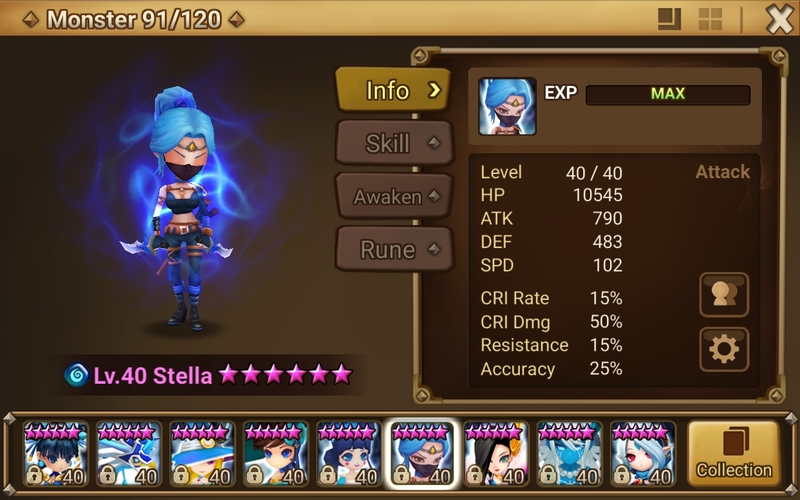 I have two regret six-stars, and Stella was one of them. I got her during the four-star summon event (which I didn’t get Galleon from), and I six-starred her shortly after the twins came out. The problem with Stella is that she is insanely stat hungry, and it pays off with damage that the twins outclass far more. You need at least 225 speed on her, at least +1000 ATK, 85% Crit Rate, 170% Crit Damage, and I’m pretty sure there’s more that I can’t think of right now. I can’t even remember why I six-starred her. 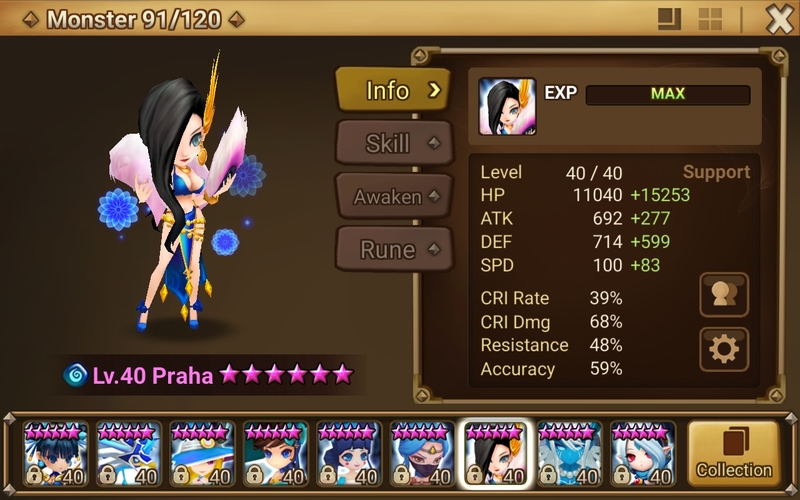 Praha and Kumar are, like, my only two nat5s who aren’t wind. I’m not even kidding, I have around 11 nat5s and nine of them are wind. Anyway, I was unappreciative of Praha when I first got her, but as I built her, I realized she’s really good! Talia is actually my second Chakram Dancer. My first was Shaina who we’ll talk about in the next article. Many people frequently say that Talia is one of the best Chakram Dancers, due to her third skill which is a massive single-target nuke. Deadly Dance is an attack that attacks twice, and the damage greatly increases once the monster she hits is at 50% HP or lower. If there’s a Boomerang Warrior in the team, that Boom will attack along and the damage will also be increased by 50%. Most people pair her and Shaina up with Sabrina. Literally the only Boomerang Warrior I have is Maruna, sadly. Hey have I ever mentioned how much I love Galleon? I finally broke my 4-year no Galleon streak a few weeks ago, and since then my GB10 times have gotten really fast. It’s all because of this guy – I swapped out my budget Galleon Shaina for him, and I went from 59 seconds and frequently wiping to a stable :50-:47 GB10 team. His third skill Time to Loot provides some of the most important buffs and debuffs: AoE defense break on the enemies, along with AoE attack buff on the allies. When you skill up his third skill all the way, the defense break activation rate is 100%, too. The best part of Galleon is that he’s so versatile. He has a little over 11k base HP when he’s six-starred and maxed out and his base attack is 747. You can rune him as a tanky support mon with Shield runes, or you could rune him as an attacker who also brings along attack buff and defense break. Tesarion was the first Ifrit (who wasn’t Veromos) that I summoned. I was actually hunting for Tesarion for a while because I really needed someone that had Oblivion. Keep in mind Herne hadn’t been released yet, so the only two monsters who had Oblivion were Isis and Tesarion. Isis is an LnD nat5, too, so getting her was out of the question. I really like Tesarion for those pesky ToAH stages where all the monsters have godawful passives. It’s so satisfying to just 100% shut them down before Miho can counterattack my Maruna and one-hit kill her or something like that. 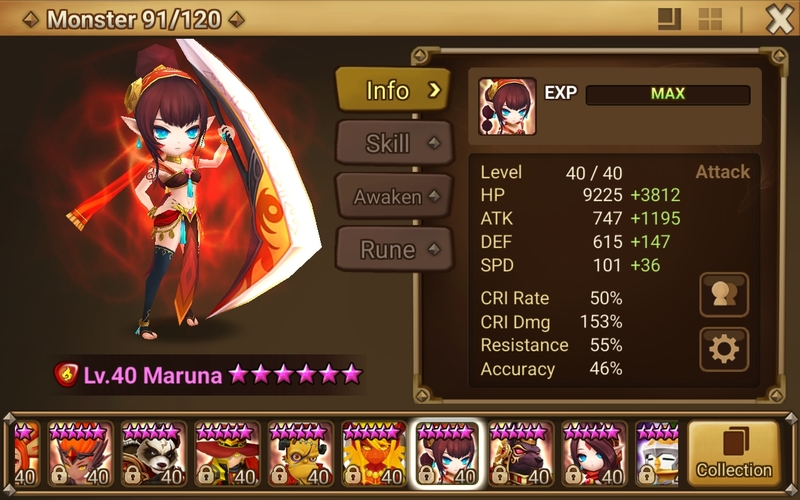 Maruna was my first of the ChakBooms; I actually got three Marunas before my Shaina. Despite that, she is definitely one of the better of the ChakBooms, next to Sabrina. Due to having two skills that are AoE stun (her third also having one target being guaranteed to be stunned), she’s absolutely a queen at the Trial of Ascension. You can rune her with Despair for even more stuns, or Violent to do more damage (and refresh the cooldowns on her second and skills). Remember that she’ll pull along a Chakram Dancer if they’re included in the team, too! These are ten or my twenty new six stars! We’ll cover the rest in the next article, which should be up in a week or so! I hope you all enjoyed this article in the meantime. I’m Sara Ann, and I’ll see you in the next article!